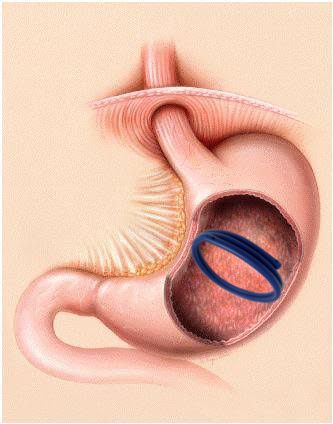 Intragastric stent is designed for the correction of excessive body weight. It has predetermined shape and size that corresponds to the size of the stomach. Stent is easily placed into the stomach without the use of general anesthesia, since it has the form of a straight elastic rod (probe) at the moment of being inserted into the stomach. Due to the unique property of titanium nickelide (nitinol) вЂ“ to remember pre-defined shape when reaching a certain temperature, the stent obtains the form of cylinder shaped spiral of pre-defined size when warmed up to the patientвЂ™s body temperature after insertion. 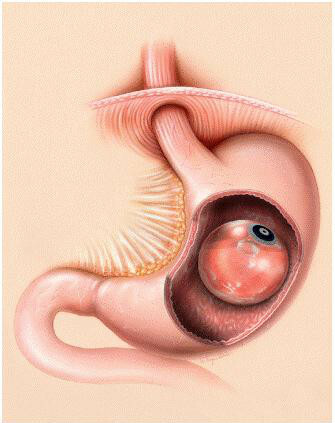 While inside the stomach it performs all the functions of the intragastric balloon. It also allows to perform diagnostic endoscopic procedures, which would be challenging to carry out in case of presence of intragastric balloon inside. Intragastric stent has at least 14 advantages over the intra-gastric balloon. Intra-gastric stent - a minimum of 14 advantages over the intra-gastric balloon. Comparative table of consumer and technological properties of intragastric stent and intragastric balloon. The algorithm works with stents, intra-gastric. Intragastric stent is installed by inserting endoscope covered with PVC tube-conductor into the gastric cavity of a patient. The length of the tube-conductor is equal to the length from mouth to the stomach. The tube-conductor is fixed in same position as inserted while the endoscope is removed. Then intragastric stent is inserted in the tube-conductor down to the cavity of the stomach. Having form of straight rod during installation, the stent expands into a spiral and presses the walls of the stomach when reaches the temperature of patientвЂ™s body. The presence of the spiral in the stomach gives to the patient sense of satiation. The procedure of intragastric stent insertion is finished by follow-up gastroscopy and removal of the tube-conductor. While in the stomach of the patient, the stent stimulates the nerve endings of the upper part of the stomach connected with brainвЂ™s satiation center. That is why patient doesnвЂ™t feel hungry. The amount of consumed food reduces drastically, and as the result, the patient steadily loses weight throughout the time period when the stent is present inside the stomach. The intragastric stent may remain in patientвЂ™s body up to 12 months. It is removed with the help of esophageal stent extractor or endoscopic loops. Implantation and extraction of intragastric stent is performed under local anesthesia, commonly used for endoscopic procedures and carried out by the irrigation of the oral part of the pharynx.